The ISB RBPC (Resolver Based Press Control) is the industry's most cost-effective and automation solution that shops of all sizes can afford to install on every one of their presses and press brakes. 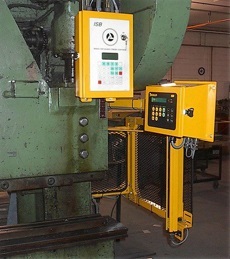 Every control contains firmware to operate power presses from hand-fed through 800 strokes per minute, as well as mechanical friction clutch and air clutch press brakes. The ISB RBPC design utlitizes two separate processors that each operate with different software and monitor every input and output. Certain companies do manufacture redundant fail safe PLC based controls, designed to be used on Punch Presses provided that the software written is deemed or certified to comply with the fail safe requirements of the current governing standards. It is the responsibility of the user to insure that the software generated for these PLCs are certified to comply with current standards. 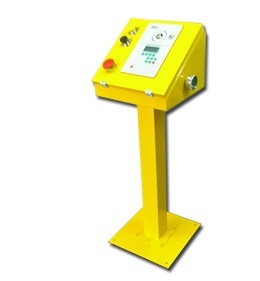 All electrical connections are made with plug-in terminal blocks for easy installation by most plant maintenance personnel, as well as allowing for easy field serviceability. The RBPC control is equipped with automatic top stop compensation, which means no more adjusting of complicated cam switch timing every time you change jobs or press speeds and this feature also makes the initial installation very easy. The very user-friendly operator interface has a 4-line LCD readout that is easy to read and displays complete fault messages and operator prompting. ISB RBPC control can accomodate multiple palm stations (4 sets), electric foot switches (2), Kwik-Trip Sensor input and even a treadle input for mechanical press brake applications. Modes of operation, such as Inch, Timed Inch, Single Stroke, Auto-Continuous, Auto Single Stroke (for feed lead press applications), and Kwik Trip are included through soft-key access. Inch/Single Stroke/Auto-Continuous can be wired to hard key switch if this is preferred, but 3 die protection channels are sacrificed. RBPC units can be used in English or Spanish language modes. Multiple levels of password protection give press operators only the level of access that they need, while set-up and supervisor personnel have their own levels of password protection. Back up and restore capability is very convenient to back up the stored programs or parameters on a remote PC to avoid setting or reprogramming the RBPC for any unforseen cause or event. RBPC in our standard free-standing enclosure. Installed on a mechanical press brake, and also equipped with a Merlin 3000 Light Curtain guaring package and ISB Built Light Curtain Mounting Brackets.